Why Warren Buffett Just Sold his Entire Stake in Procter & Gamble Co. The billionaire investor exited one of Berkshire Hathaway's top four positions -- but the reason he did so isn't one that applies for retail investors. Berkshire Hathaway (NYSE:BRK-A) (NYSE:BRK-B) isn't quick to sell its stocks. In fact, CEO Warren Buffett's favorite holding period, he likes to remind shareholders, is "forever." Yet the company just closed its Procter & Gamble (NYSE:PG) position -- over $4 billion worth -- according to its latest 13-F filing. That holding had been large enough to qualify as one of Berkshire's "big four" investments, and has been on its books for over a decade. P&G shareholders can relax, though. The sale wasn't spurred by the billionaire investor having lost faith in the company. Instead, it was simply a tool by which Buffett could efficiently raise cash to focus Berkshire's position on one piece of P&G's portfolio: Duracell batteries. Berkshire's P&G holding came into being in 2005, but not through direct stock purchases. That was the year that Procter & Gamble purchased razor blade titan Gillette, a company that Berkshire owned a significant stake in. Buffett received P&G shares in exchange for his massive Gillette holdings (and booked a nice $5 billion paper gain in the process) as a result of that deal. Procter & Gamble has been one of Berkshire's largest holdings ever since. That run effectively ended in late 2014 when Buffett struck another deal with P&G to buy its Duracell business in exchange for Berkshire's shares in the greater company. Structuring the transfer this way was classic Buffett: It helped his company save on taxes while establishing ownership of a stand-alone company. Buffett is a fan of equity investments, but prefers to own companies outright. "Our main focus is to build operating earnings," rather than simply achieve growth in the investment portfolio, he has told investors. Though Buffett's sale wasn't connected to P&G's operating trends or valuation, it's worth considering whether investors should follow his lead and sell the stock. After all, the consumer goods giant hasn't managed significant growth in over two years. Sales are down due to a combination of weak organic growth, foreign currency headwinds, and a portfolio divestment initiative that has trimmed its down to 65 brands from 166 three years ago. Profits are on course to decline for their second straight fiscal year, and income investors just received their smallest dividend raise yet. On the other hand, Wall Street is getting more optimistic about the business, judging from the stock's rising price. 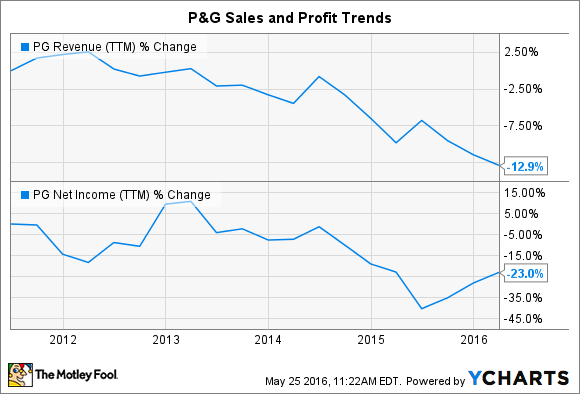 P&G's huge cost-cutting initiative is pulling profitability higher. As a result, returns to shareholders (in dividends and stock buybacks) are increasing as it posts a near-record level of cash flow generation. Meanwhile, there are a few bright spots in its portfolio such as Tide detergent and Pampers diapers that management believes illustrate the path toward healthier growth over the coming years. The brand shedding process is almost complete, too. If all goes to plan, the resulting company will be smaller, at about 85% of the prior revenue mark, but more profitable, with roughly 95% of past earnings. P&G should also be able to grow more quickly from that point forward -- assuming executives were right in selecting which brands to keep and which product lines, like Duracell, to walk away from. If you lack faith in P&G's transformation plan, then you might want to sell your shares now. Just don't exit the stock simply because Warren Buffett did. He was able to roll his P&G holdings into another consumer product bet under extremely favorable terms -- which isn't an option that's available to non-billionaire investors.